Some (but probably not too many of you) might be wondering who Kaffe Fassett is and what all the hubbub is about. Well, let me tell you because Kaffe is coming to town! Urban Yarns and The Cloth Shop (a lovely little shop, just down the block from UY. I’m not much of a quilter but I never leave there empty handed….) have joint ventured to bring Kaffe Fassett and his partner Brandon Mably to give a talk and a workshop. Anyone with a love of colour should not miss this opportunity to hear Kaffe speak or to learn from Brandon in his workshop. 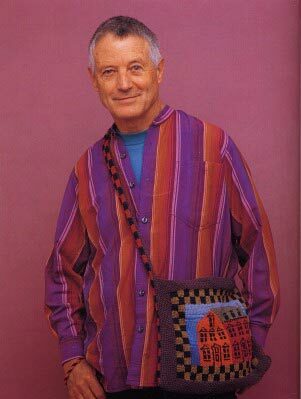 The name Kaffe Fassett has long been a staple in the world of knitting and quilting. He is best known for his colour and design work which has gained such popularity he is even the subject of a one man show! Kaffe’s revolutionary colour combinations have spawned lines of yarn and fabric and several books on the subject. He is a man of simple designs that show off the beauty of his unique colour combinations. His book Kaffe Knit Again is in the shop and it’s quite the inspirational book to flip through. Brandon has been working with Kaffe for many years now and shares his love of colourwork. While Kaffe’s talk will focus on elements of design, the workshop will have demonstrations and instruction on the Fair Isle knitting method with up to 12 colours at a time! This is a once in a lifetime chance to see and work with 2 very talented men. The talk with Kaffe will take place on Friday, October 1st from 7:30-9:00 at the UBC Golf Club, and the Persian Poppy Workshop is Sunday, October 3rd from 10-4 with a break for lunch (which is provided). Give us a call to sign up for these events. Tickets are selling fast so snap up your tickets in a hurry! This entry was posted on Thursday, August 5th, 2010 at 10:09 pm	and is filed under Uncategorized. You can follow any responses to this entry through the RSS 2.0 feed. Both comments and pings are currently closed.